"I call it Z. It is there"
The Lost City of Z, based on the non-fiction book of the same name by David Grann, which in turn is based on the true story of British explorer Percy Fawcett, is an initially engrossing tale that gradually loses steam before reaching an unremarkable conclusion. 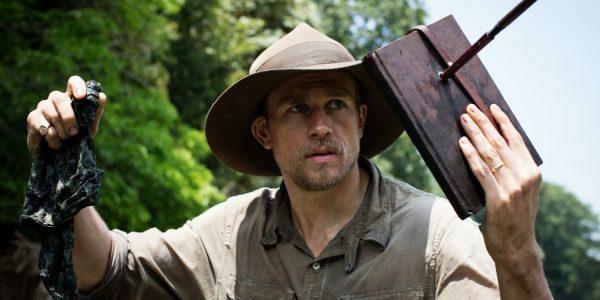 At the turn of the 20th century, Percy Fawcett (Charlie Hunnam) ventures deep into the uncharted Amazon and becomes fascinated with the idea of a lost, previously unknown civilization in the region. With the support of his wife Nina (Sienna Miller), as well as his trusted companion Henry Costin (Robert Pattinson), he returns time and time again to the jungle to find what he has dubbed the Lost City of Z. Fawcett in the movie is portrayed as a stoic progressive. He respects and admires the natives of the jungle, refusing to think of them as savages, which makes him open to the possibility of civilizations predating ones already known. He is not, however, entirely open-minded - when his wife Nina asks to go with him on an expedition, he steadfastly refuses, as the jungle "is no place for a woman." While he certainly makes a valid point about Nina lacking the military training that could her endure the hardships of the Amazon, he also makes it quite clear he has a very rigid understanding of the roles of men and women. It's an interesting wrinkle to the character. Roughly midway through the film, explorer James Murray (Angus Macfadyen), who joins one of the expeditions, remarks that Fawcett doesn't care about the lives of the people with him, or his family and that he's only interested in finding the lost city. Even though the subtitle of the book is "A Deadly Tale of Obsession in the Amazon", this is the first indication that Fawcett is at all obsessed. Part of it comes down is Hunnam's performance. He's a capable lead, but nothing about his take on Fawcett suggests the intensity of an all-consuming, dangerous obsession. There are times where he seems unable to let go, but for the most part, he appears to be acting fully within reason. To be fair to Hunnam, that's how the character is written as well. Sure, the scientific community is somewhat skeptical about his theory, but he's not completely without support. There's evidence to back up his claims and he never acts in a way that would endanger his life or the lives of those with him during the expeditions. His eldest son, Jack (Tom Holland) accuses him at one point of not thinking of his family and only being in it for the glory, but it rings false, as this Percy Fawcett seems to genuinely care for his loved ones - the expeditions as well as serving in World War I are what he considers painful, but necessary sacrifices. He's sensible, persistent and honorable throughout - and it eventually starts to get boring. There's just no real sense of progression. Time goes on, as the movie spans nearly two decades of Fawcett life's right up until his mysterious disappearance during his final expedition with Jack in 1925, but he more or less remains the same character. He learns to think less of rank and distinction, after expressing disdain for his own lack of medals in an early scene, but that's kind of it. The narrative moves along laterally, but it doesn't really build up to anything. It just fizzles out and then stops. It's a shame because The Lost City of Z is a beautifully shot movie. It does a fantastic job of evoking the danger and wonder that one associates with the jungle and absorbing the viewer into its lush interior. The acting is fine across the board. Tom Holland is only in a handful of scenes and his character is somewhat inconsistent, going through a not unbelievable, but not really well set up a change of heart about his feelings towards his father - but he still turns in a good performance. Ditto for Robert Pattinson, who is almost unrecognizable under a thick beard and glasses. The Lost City of Z successfully captures your attention at first but fails to hold it by the end. Whereas Percy Fawcett'ss life ended on a question mark, this is a movie that ends on a dissatisfying ellipsis.